The other day I walked to Santa Rosa Rural Cemetery very early in the morning, around 6:30 a.m. The air was deliciously thick with fog and it was cold, something I appreciated in light of the heat wave plaguing most of the country at the time. As I wandered I heard a distant but loud chorus of songbirds and followed the sound to see if I could identify the birds singing. I thought they were probably goldfinches but wanted to confirm my guess. 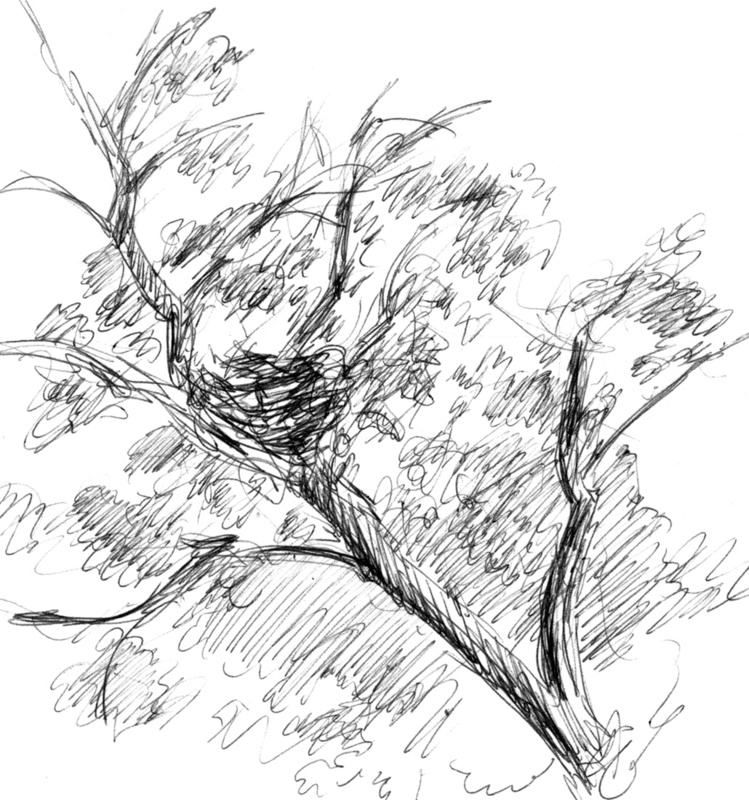 As I drew nearer I began to scan the live oak (Quercus agrifolia) canopy. I could see small shapes flitting among the leaves and branches but the light made it difficult to see anything other than shape. I began backing up a hill to make it easier to look into the trees when I suddenly saw an interesting lump on a branch. At first I thought it might be a fungus, then an owl and finally I realized that it was a young Cooper's Hawk (Accipiter cooperii) hunched low. 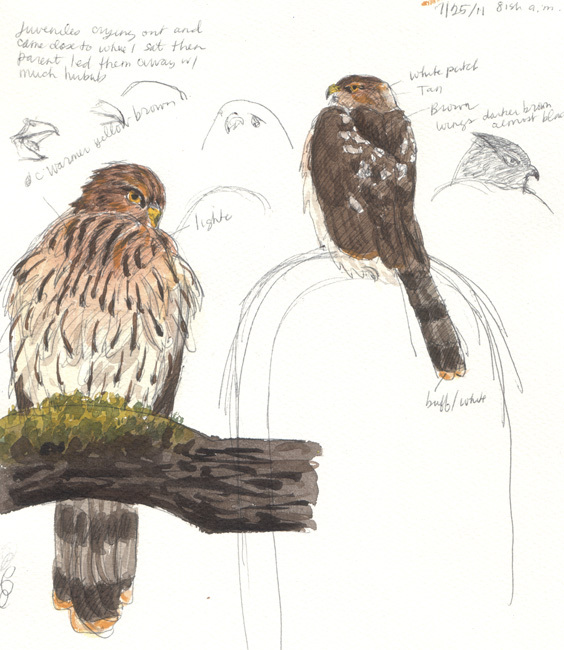 I was fascinated and got out my paper and pen, hoping the hawk would stay a while so I could draw him. As I sketched the fog began to break up and I saw that the songbirds were, indeed, goldfinches, Lesser Goldfinches (Spinus psaltria), to be exact, many of whom were flittering about the hawk with no apparent concern. I was certain that the hawk was waiting to catch one for it's breakfast. 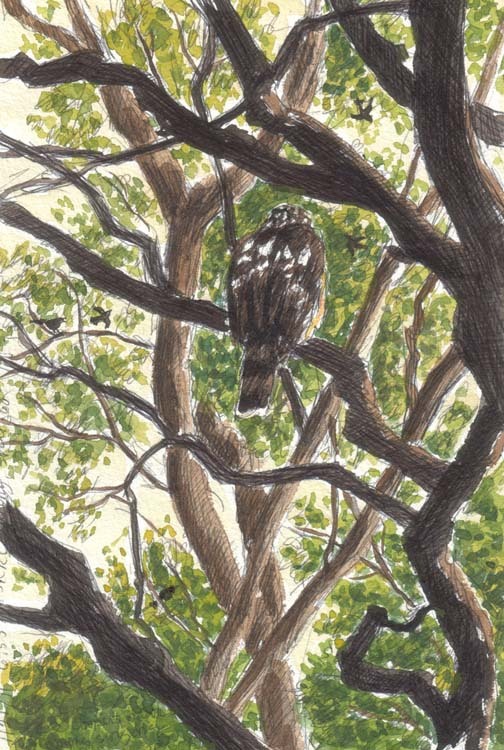 He stayed on the branch for a long time, then was gone, with a few harsh cries, while my head was bent to my sketch paper. It didn't seem as though he had caught a bird on his way out, though the finches were silent and still for several minutes after he was gone. Then they went back to singing and flittering and I packed up and went home. 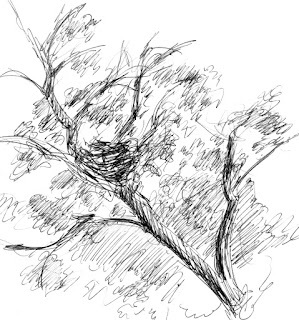 Since that day I've seen two young hawks soaring through the canopy on several occasions. They call to one another as they fly, making it easy for me to follow them around the cemetery. Like may young birds and mammals I've encountered, they're not as wary as adults and often land on branches or gravestones very near where I stand or sit. A couple of times I've seen them with a third bird, who may be an adult but never gets close, or stays long enough for me to identify. I suspect that the parents are still feeding them, at least some of the time. One morning I found one of the fledges near a large nest and could hear the other but was unable to find her until she climbed out of the nest and perched nearby, crying out rather pitifully. Afterwards, I found several more similar nests that I suspect are from previous years. By 8:30 a.m. it becomes difficult to find the birds as they settle down in the tree tops. Without the aid of sound, I've found it nearly impossible to find either bird. The patterns and colors of their plumage allow them to blend right into their environment. Although Cooper's Hawks hunt by day and eat birds, their preference is for bigger birds than goldfinches. They like Rock Pigeons, Northern Flickers, Mourning Doves and Jays, as well as some small mammals and will generally leave the small birds alone. As breathtaking as it is to watch these hawks fly through the canopy it apparently takes it's toll. A study of more than 300 Cooper's Hawk skeletons found that 23 percent had old, healed fractures of the chest. 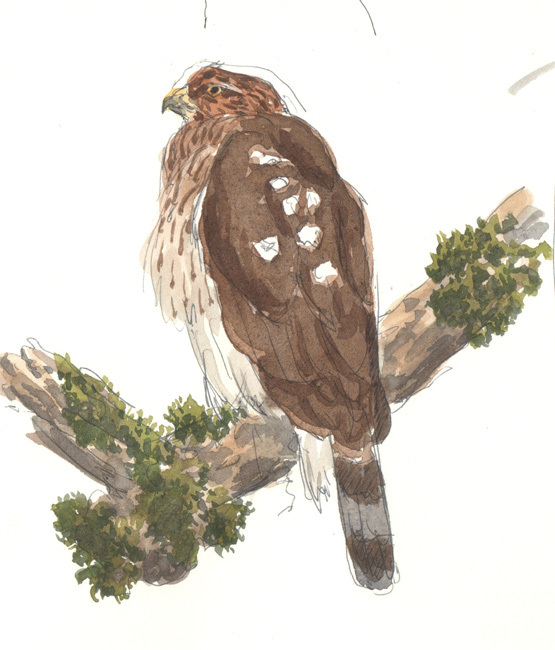 Cooper's Hawks were once only found in the country but are now more prevalent in urban and suburban settings, probably because of the abundance of Rock Pigeons and Mourning Doves.